Hi, I’m using Local Flywheel to create my site. And I am using Page Scroll to id for my menus. I wonder why every time I do back to edit something on my page, The code is gone and It doesn’t work. I actually saved it every time I done the work but Next time I open the website up again, It’s gone so I need to create the link again. Is it possible that it’s because I’m using flywheel? Please help..
I’m not familiar with Flywheel but what you describe sounds like it a Flywheel/theme/editor issue, although I can’t say for sure. The plugin does not save by itself any values (including links) in the post/page editor, builder or wp menus. How and what code do you add in your page? Shortcodes? Plain links? 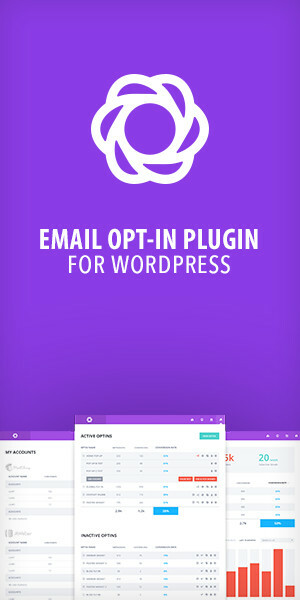 Do you add them via plugin’s custom buttons? I need more info in order to help. Hi man, I already installed your plugin but it does not work for me. Always send for the top of page, and no for de anchor. Can you help me, please? before the opening <html> tag in your theme. Wow man, Thanks, This error is very stupid, but thanks. I’m building my Morpheus (http://morpheus.smallfacemedia.com/) themed website on localhost. Each page section, on the home page, uses it’s own <section> tag; for example, on the above link you’ll see a section shown as <section id="parallax-presentation" class="page-section">. How can I use these existing sections so that scrolling will automatically scroll to each section? If your theme has target ids (like the one you posted), then you don’t have to create any targets (you only have to create the links). 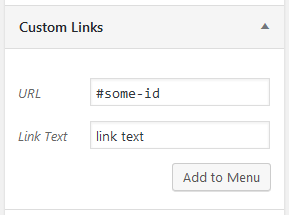 So for example, if you create a link with URL #parallax-presentation, it’ll scroll the page to that target section/id. Everything is working fine, however the /#section at the end of the URL in the address bar is not updating as I scroll through the page. Any way to make this happen? There’s no way to do this on-the-fly while scrolling the page (via mousewheel, the scrollbar etc.). In general, I’d strongly advise against such functionality because it messes with browser’s history and the user experience, without offering anything meaningful to the user. This said, you can enable plugin’s “Append the clicked link’s hash value to browser’s URL/address bar” option to have the /#section fragment appear when the user clicks the links and bullets. Thanks for your amazing plugin. It really helped me. But I have a problem with the offset feature. It doesn’t seem to be working. I tried to stop scrolling the page before my sticky menu by setting the offset to the height of my menu. but it didn’t work. Appreciate your help. i.e. you need a dot before the class name. I’m not able to make the plugin work. No errors comes up in the console. The plugin does not work because your theme does not scroll the whole page. All root elements (i.e. html and body) in your theme are hidden without a scrollbar. The theme you’re using is currently scrolling an inner element (.content-wrap) that wraps your content. “Page scroll to id” does not work on overflowed inner elements like this. The buttons Insert Page scroll to id target and Insert/edit Page scroll to id link have disappeared from my WP visual editor. It’s hard to use the plugin without them. Where have those buttons gone? I’m running WP 4.9.6 with the Genesis Framework Parallax Pro theme. I also use the SiteOrigin editor (although I’m not using it for my current post. “Enable insert link/target buttons in post visual editor” is checked. It’s not possible for the “Page scroll to id” buttons to disappear by themselves without any changes to your installation. Did you install/update a plugin? This said, you don’t need the buttons. Plugin’s shortcodes do exactly the same thing, so maybe you could use them directly in the editor. Let me know if the shortcodes work for you, otherwise we’ll find another way. Also note that “Page scroll to id target” is available as a SiteOrigin widget so you can use it in the builder. Thanks for this Cool Plugin, but I have a question. The plugin cannot work like this (at least not without extra code and additional plugins). This said, I would avoid this functionality on my website. Changing browser’s URL on-the-fly while scrolling (without an actual action from the user) is not a good thing for like 99% of sites. This functionality messes with browser’s history without adding anything meaningful for the user (if I want to see the “previous” page, I just scroll up). 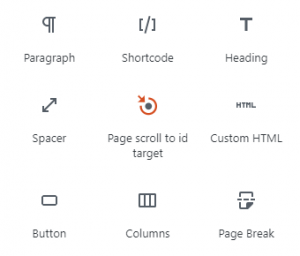 It changes the way users use the back and forward buttons on their browser which is not a good thing (the user will hit the back button endlessly just to go to the actual previous page). It seriously traps browser’s history. I am using your plugin in my client’s site and it is working nice. However, I am curious about your video tutorial. In your browser, I can’t see the URL with the each section id in the address bar. From mine, whenever click one of menus, I can see the URL with the menu id like https://www.websiteurl.com/#about. Can I make it invisible like you did? To see the hash (#) value in browser’s address bar, you need to enable the “Append the clicked link’s hash value to browser’s URL/address bar” option in plugin settings. Do you have this option enabled? If yes, just disable it. If you don’t have the option enabled and you still see the URL hash in the address bar, there might be some other plugin (or theme functionality) doing this. If you can post your page URL where you have this issue, I could check it and I’d probably be able to give you a solution. I’ve checked the option and it was disabled already… Hmm I guess you are right about that some other plugin doing this.. Please take a look the website and let me know what you think. Sorry about that. Here it is. I checked your page and the plugin is currently not enabled on your menu links. This probably happens because your theme uses a custom non-standard menu function which prevents “Page scroll to id” from being enabled on the menu links automatically. But don’t worry, it’s very easy to manually enable it on your links. You can read more and find alternative solutions in the “Creating links in WordPress Menus” section above and FAQ. Thank you so much, Malihu! can I use this plugin to initiate auto scroll to specific element ID after page load? The page is for search purpose and I want to auto scroll because in mobile view, the first visible element is side bar. I would like to scroll below sidebar. If it is desktop view, nothing would happened as the element and sidebar are on top. But in mobile view they are not. I can’t add plugin shortcode as no text will appear in page. The page is as I mentioned for search purpose and it will not show any other element. But I can look at the code and find the ID of element I want. So any way to achieve auto scroll on load with this plugin regarding above? Hi, I was wondering if it was possible use the plugin with someting else than <a href="myAnchor">Here</a>. Would a scroll event work to trigger the plugin ? I’m currently using the Divi template. My website is a work in progress, therefore i was asking before actually trying it out. Not sure if this is what you need. If you could give me an example of what you want to do I might be able to help. I’m having trouble with the scroll to id. It was not working with my website. Im using crexis theme. I used go buttons and linked properly. When I click the buttons it just stay where it is and the url is just changing but not scrolling to the row itself. I checked your URL and I can’t find any links that scroll the page. Please let me know which page and which link(s) to check. Thank you for the reply. The page is currentlt published privately but here’s the link. I just checked your page and there are no id targets in the document. For example the link “Cover Options” points to #coveroptions but there’s no coveroptions id target in the page. You need to create the targets. After you create the targets, you should also enable the plugin on all the links that already exist in your site. You can do this easily, see here. I’m having trouble getting Page Scroll to ID to play nicely with my Acid theme. From what I can see, Acid is no longer available for download or support, so I’m kind of at your mercy. Acid should have had this scroll-to feature built into it already, but I digress. I notice that when I click my menu links, it no longer puts a #nameoflink at the end of the URL, so I think it’s doing *something*….just not scrolling. Or highlighting. The plugin works only with browser’s native/default scrollbar. It works strictly by scrolling the document’s root element (html/body), not overflowed div(s). Your site/theme uses an overflowed div with a custom js scrollbar so “Page scroll to id” cannot do its thing. I can’t help unless I see your page. Can you post your URL? Like a few other folks, I’m having a tough time with the offset. It doesn’t seem to work with my theme, whether I change the offset in the main settings or add it directly to the shortcode. FWIW I’m using WPBakery Page Builder and have each PS2ID in its own row. I need to see your page in order to see what happens and help. Can you post your page/site URL? FYI I can’t open your site because it’s blocked by antivirus. Are your links point to same-page sections or sections on different page(s)? When you click a link does the page reload? If yes, you need to set the correct URL in your links. Make sure your links URL matches exactly your site URL (www part, https etc.). The plugin works fine, thx! But one issue i cannot solve: If I click 2 times on the same link or click on another link while scrolling, it ends up in a white screen… what am I doing wrong? This is an issue with your theme (if you temporarily deactivate “Page scroll to id” you’ll have the same problem). Go to “Page scroll to id” settings and enable/check “Prevent other scripts from handling plugin’s links” option. Save changes and test your page. It works for me. I just checked your page and double-clicking the menu links (or clicking them while page is scrolling) work as expected without the white screen issue. is it possible to add a vertrical progress reading indicator in the widget like https://css-tricks.com/reading-position-indicator/ ? This is completely out of plugin’s scope. I could only see this as a different plugin (maybe complementary to “Page scroll to id”) but not as a “Page scroll to id” core feature, as its functionality is not related to what the plugin does. is posible add the offset in the link? I’m using your plugin and it works great, thank you. I have one question/issue about a behaviour with the browser url though. Is it possible to hide the hash value all the time? Because when I click on a menu link that opens another page, the hash value is still appended eventhough ” Append the clicked link’s hash value (e.g. #id) to browser’s URL/address bar” isn’t checked. There’s no option to hide the hash value when coming from a different page/URL. The appended hash value is necessary so the plugin script knows where to scroll the page (since there’s no user triggered action, like clicking a link). This said, the only way (at least for now) to hide the hash when coming from other pages is to manually edit plugin’s script and changing some code. If you want I could tell you which file and how to modify it and see if it helps. I’m definitely interested in knowing which file to modify? This will instruct the plugin to load the non-minified scripts that you can edit. You can add the above code before the “That’s all, stop editing! Happy blogging.” comment in wp-config.php. 2.Go to plugin directory (e.g. /wp-content/plugins/page-scroll-to-id), open the js folder and edit jquery.malihu.PageScroll2id-init.js file. You can change the line above or comment-out the original and add a new one with the modified code below it. That’s it. Save the file and test you page. Please note that on the next plugin version I’ll probably add an option for this feature. So if/when you upgrade, you’ll just need to remove the constant from the wp-config.php and enable the related (new) option in plugin settings. well it’s a great plugin but I am having an issue with the jumps, when click on any “#” or anchor link to jump on page. It cuts down the fist 1 and a half lines. Can please guide me, maybe I am doing something wrong. I just checked your page (lookgadgets.com) and the plugin is not installed/activated. when scrolling. And what is amazing it re-appears again. So the user may be able to interact with sections properly. I think this is one of the best solution for this problem. the plugin works well on the same page, it places some links with texts, and when you click it works correctly. It seems that your theme’s navigation menu prevents “Page scroll to id” from auto-enabling itself on the menu links. 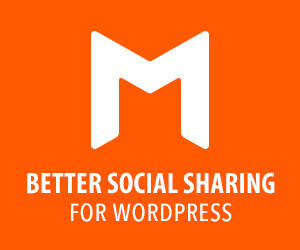 2.Enable the plugin on your WordPress menu links manually. 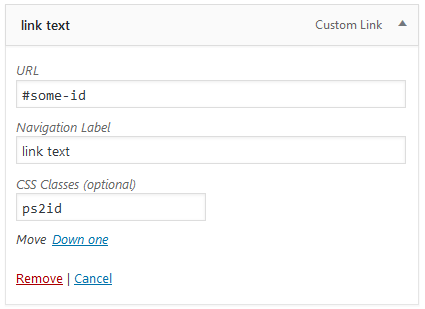 Where do I insert the “rel” code if I’m using the visual composer “button” settings? I can only put the URL link. The plugin will now be enabled on any link in your page that has a hash (#) in its URL. Hi Malihu from Italy ! I am using your plugin in my site and it is working wery well. However, when I navigate the first time on home page and select the last menu tab (contatti) the window does not scroll enough and I have to click two time to set ancor correctly. This appears too when I click on the same tab menu from another page. Is there a way around this? Hi Malihu from the UK! I am using your plugin in my site and it is working perfectly inside a page. However, when I navigate to my scroll id from another page (say the homepage) the window does not scroll enough. I think this is because I am using images with height set to 100vh (so the images load and re-size after the page is loaded). Is there a way around this? You could try using the delay for scrolling to target on page load option to how many milliseconds after the page is fully loaded, the scrolling will take place. For example insert 500 (i.e. 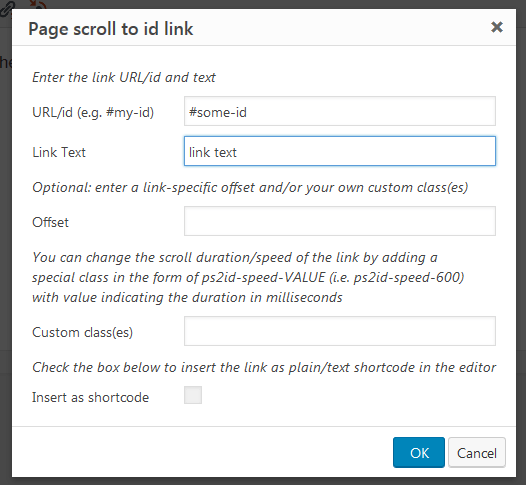 half a second) in delay field, save changes and test your link(s). The issue you describe though sounds like you’re using a lazy-load image plugin (a script that loads images as you scroll down the page). Do you use such script/plugin? Let me try that again! I would like to be able to scroll between front page sections of my site using a button. So for instance. Front page one was a button on it that says Read More which would scroll me to front page 2 section. So I changed it to: <a href="#text-31" class="ps2id">Learn More</a> but I don’t know how to get my button back. Also, there are being done through the widget section. I have a question. Can you put more then 1 selector in the offset field> for exampe: #masthead and .mob-menu together. I am using to 2 menu’s together when it goes mobile. Is that possible? No, you cannot put 2 selectors in the “Offset” field. You can use plugin’s offset expressions in order to bypass the offset value in one of your menus (e.g. disable offset on mobile), but I’m not sure if this helps you. Hi from France Malihu ! Thank you for this plugin really practical ! Easy to use however but i have a problem. I made my page with Builder SiteOrigin. And when I’m in the lower section of the page and I want to go back a section for example, it reloads the page at the top to immediately descend on the section. Is SiteOrigin a problem or who did something wrong? Your issue is very easy to fix. Your server is configured to always redirect to the www subdomain. So when you go to your-site.com/some-page/ it automatically redirects to www.your-site.com/some-page/. Your links URL do not have the www part. That’s why when you click a link the page reloads (seems to go up before scrolling), instead of just scrolling to the section. Simple, fast, effective, just perfect !